Because of your wonderful comments and requests, I have written this pattern in a multitude of sizing to accommodate everyone else's heads! 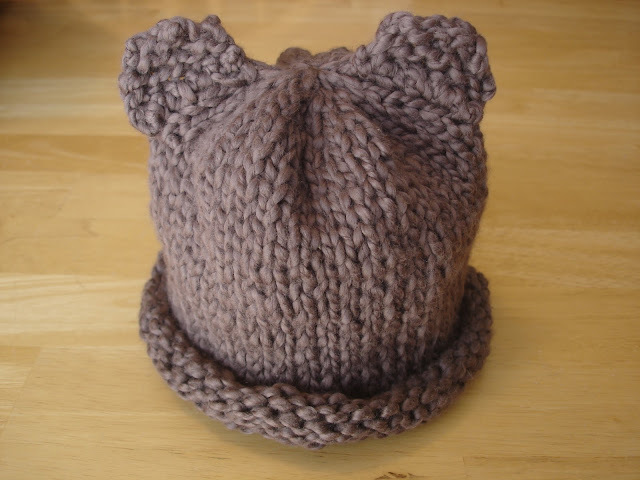 Please Note: Pattern includes instructions for both a seamed hat and a hat in the round. Click here for Preemie, Newborn, and Baby sizes! Note: hat is very stretchy, but measure circumference of head first for best fit. CO 56 (64, 72) sts leaving a long tail for seaming up later. Work in st st until hat measures 6.5” (7.5”, 8.25”) from CO edge, ending on a WS row. Begin working in st st (knit all rounds) until hat measures 6.5” (7.5”, 8.25”) from CO edge. Stitch both ears to top of hat with tapestry needle and matching yarn.. Weave in any ends. I'm a beginner knitter. I can do this one, and it's super cute. Thank you so much for posting this and the original baby hat. Is it ok if I sell the hat that I made from ur pattern? Super cute, love the one you made! I was hoping to get the pattern for 6 month size, I thought it would be under "the rest of us" sizing but didnt see it. Maybe im missing it?! But if you could email it to me that would be great! More than beautiful, thank you! Hi Denise! Thanks so much! Your shawl is gorgeous!! Yay! Good for you trying things in the round, really makes things a bit faster! Happy knitting to you! Thank you so much for offering these patterns!!! for the decrease when do u do tht ? the first 9 rows or the last 9 rows ? or do u just do the 9 rows like tht , then repeat? Hi Nataly! I hope I am understanding your question, but you would knit the main part of the hat first, which will generate a cylindrical tube, then do the decrease part to close up the top. Just work the decrease rows once. Can't wait to make it, thanks for sharing such a cute pattern! Hi Colleen! The newborn hat is extremely generous in size and can stretch to fit an older baby's head too. A few babies I knit this for ended up wearing their hat until their first birthday! That being said though, I would try going up a size, because the baby is 9 months old, the next size up will give them more room to grow with the hat and they would be able to wear it longer. I hope that helps, when in doubt you could try measuring the circumference of the child's head and see if the Toddler size is a closer fit too. It should be K4 K2tog then repeat this to the end of the row. I loved Thaysa Patterns. A long time ago I try to find it. Thanks to Charingwith Us. I need some advice. I have 2 teachers at my school who just gave birth two girls. I like to make the babies and maybe even the Moms a bear hat. Do you think I should make them all in brown, or ???? What would be classy? Baby in brown and Mom in black? Would pink for baby be ok or not realistic? Really need some advice on this one please. Hi there, making this for the toddler size, and the first ROW 1 decrease isn't adding up. I did (K4, K2tog) across and am left with 2 stitches...is this correct? Or am I supposed to K4, and then K2tog across to the end?